Sometimes fitness equipment is sadly just another piece of fitness equipment. Other times it is like the sky opens up and a tiny piece of heaven pierces through all the clutter. The Fuel FT94 Treadmill is one of those shining gems among what is sometimes more like a pile of rubble. Then again, this is the same maker of high-powered Sole ellipticals, and also the creator of two new hotly anticipated treadmills. The kicker is that The Fuel FT94 treadmill comes in at under 700 dollars, which puts it on a pedestal. Giving it the thorough workout test, the team took it for a 12-day test run of both walking and running workouts. To be fair, we used two different people, of which one was bigger and the other petite. Testing the weight limits of The Fuel treadmill for nearly two weeks with anywhere from 15 to 45 minutes of running, jogging, and walking, made sure that the machine could keep up with us. It came through with flying colors on all accounts. The idea is to keep it real by using real people to test these real treadmills. We do not involve any scientific gadgets, nor do we bother with testing the claims of the speed, or efficiency of machinery either. Basically, if we like running and walking on it that is the best test of how it holds up in our book. We probably work our treadmills harder than other people. The FT94 was easy to get out of the box and took about as much time and finesse to assemble as other treadmills. Schedule up to an hour to assemble it and you will be gladly surprised by how fast it goes. Be forewarned that the console does have a hole that takes some persistence to line up properly. We started to wonder if the machine was flawed but soon realized that it was just going to take some sweat and potential tears to get it all assembled properly. The award-winning Sole ellipticals and their own treadmills are all manufactured in the same plant as the FT94, which is in itself a glowing product recommendation. The reason is that a manufacturer that handles all three means that all three will be well made. We already knew that the Sole lines were exceptional, so it means that the FT94 is en par with them automatically. 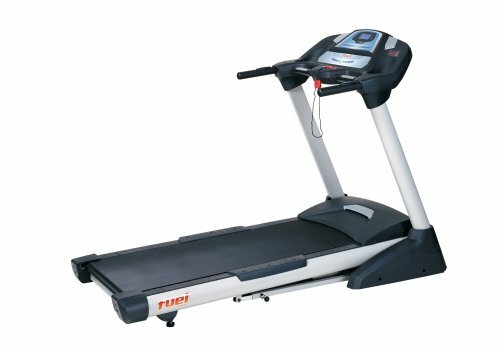 The actual components of the FT94 are similar to the Sole F63 treadmill. The electronics and the warranty differ. Even the motors on both models are nearly identical both working at 2.5 HP. The Fuel FT94 has one distinctive advantage over the similarly made Sole treadmills, and that is that it carries a lower price tag than them. It actually has not only a heavy duty frame that we tested, but also provides easy folding, shock absorption, hand grip heart monitoring, and Mp3 speakers. Finding a high-performance home treadmill does not mean spending 1000 to 1299 dollars anymore either. The FT94 is probably the best-valued treadmill that is available in exchange for just 700 dollars. Another great model is the Fuel FT96, which carries some upgrades when compared to the FT94. The Fuel FT94 treadmill comes it under 700 dollars and contains some great features from easy-folding to mp3 speakers, a heart rate monitoring sensor on the grips, and is fairly easy to put together. It can take a beating of intense workouts one after another too.